Dr. Seuss is best known for his allegorical children’s books on themes like protecting the environment, shunning materialism, and embracing multiculturalism. But many people don’t realize that before writing those children’s books, Seuss also worked on commercial art for a pesticide company. As farmer and author Will Allen noted in his 2007 book The War on Bugs, Seuss also created illustrations for pesticides in the late 1920s. The book’s publisher, Chelsea Green, has made the full chapter of the book available online for a limited time. Seuss created this cartoon for Flit bug spray.Back when Theodor Seuss Geisel was a young cartoonist, Standard Oil—a major player in the petroleum industry that had branched out into making bug sprays—noticed that he’d used their Flit spray guns in several illustrations. Standard decided to hire Seuss to make funny cartoon advertisements, which appeared in national magazines and newspapers. He did work for the company between 1928 and 1943, and “is generally acknowledged to be responsible for greatly popularizing the use of household poisons,” writes Allen. Seuss helped America become friendly with poisons; we could laugh at ourselves while we went about poisoning things. In the process, the public grew comfortable with the myth that pesticides were absolutely necessary. Perhaps Dr. Seuss realized his earlier mistakes and indiscretions with Standard Oil’s Flit and tried to make amends with The Lorax. 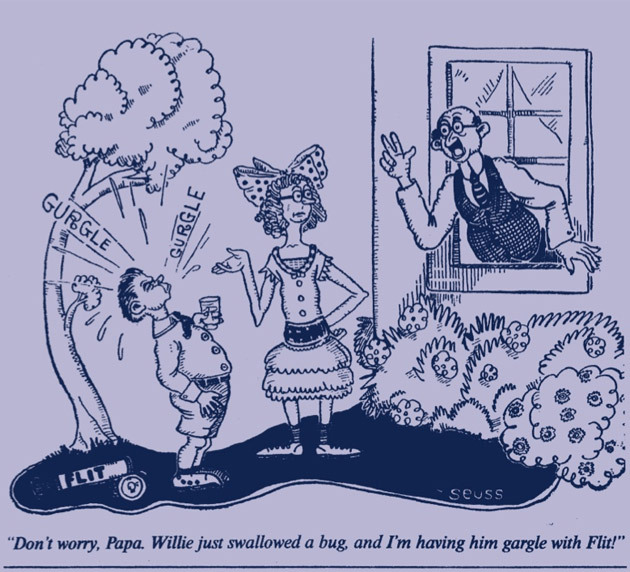 Geisel must have known that Flit’s cartoons and his World War II cartoons for DDT had an enormous impact on the public’s use of pesticides and acceptance of DDT. After Seuss used Flit as a prop in this cartoon, Standard offered him a job. 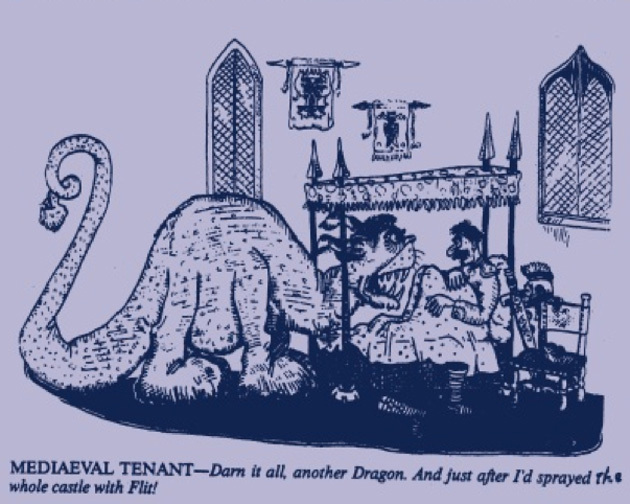 Another cartoon Seuss drew for Standard’s Flit ad campaign.